I was going to write about Daniel first, but there is sooooo much to say & I’m on my phone. I’m going to need a real keyboard for his shenanigans. So today you get to hear about Lydia. She’s been doing speech about once a week since January, and she IS making progress, but it’s slow. Slow because she is stubborn as a mule. She CAN talk, she just WON’T. Still. She can imitate words (when she feels like it) and all the sounds are there. She can say whole sentences “where did it go?” “Oh! What is that?” But again, only when she feels like it. And almost all her speech is imitating, not spontaneous. Anyway. The point is she is still FAR behind what is developmentally appropriate and she will be 3 in 4 months (😳 HOW) so that means it’s time to transition to preschool! She’ll be in the same program as Daniel and I’m very excited, because I love them. (Before the speech stuff started, I wanted to apply to see if she could be a peer model.) So YAY! Likely she’ll start sometime in January. I really think being around kids her age who talk will do the trick. Sleep. Yeah, she still doesn’t like it. It’s okay sometimes. It’s crap a lot. She’s awake right now, even though she is exhausted from being awake from 11 to 2 am. But you know, at least it was happy times! P.S. In the time I was typing this, Daniel escaped his bedroom like a dozen times. Childproof door locks get here tomorrow!! I’ll spare you the (rather long & involved) backstory here, but we had a full size mattress with no bed to go with it. Just the mattress. It’s been on the floor in the basement with sheets on it (I’m willing to be “mattress on the floor” trashy but not “BARE mattress on the floor” trashy. Apparently that’s where I draw the line.) 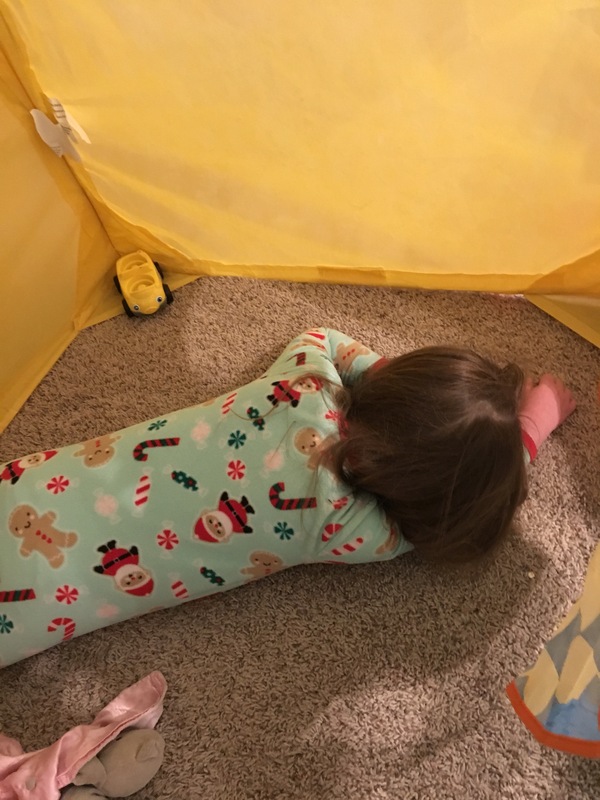 Anyway, it’s actually been used quite a bit- for company, for Kalena when we’re trying to sleep train Lydia and there is much crying, for an extra bed for “quiet time” when all the kids are home. I’ve thought several times that we should get some kind of frame for it, since that seemed like the responsible adult thing to do, but thinking that was as far as I’d gotten. Then this week my parents came to visit and my dad asked what I thought about getting a frame for that mattress. Obviously I thought this was a great idea. (Previous visits he’s slept on one of our couches, because apparently he thinks he’s too old for a floor bed.) And when my mom and I were at IKEA we picked out a bed frame that seemed like just what we were looking for. Plus, BONUS, no need to buy a box spring! So the next day we sent my dad and Brian to IKEA to pick up the bed. They were confounded by IKEA and the trip involved one phone call (my dad, reading product names to me, “all these words sound Scandinavian”) and multiple texts (Brian: this place is hard) but in the end they got home with all the right pieces. They got everything set up in a jiffy (and with no swearing! That I heard anyway.) And TADA! 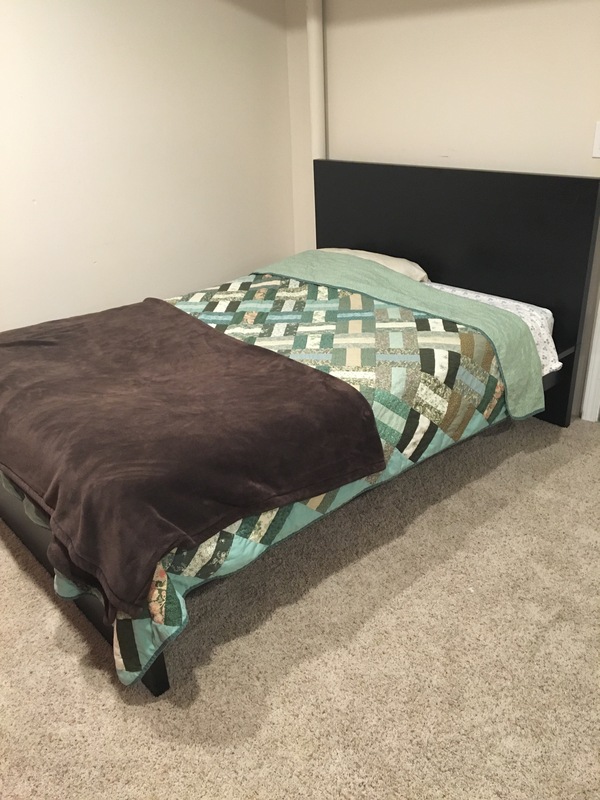 Beautiful new basement bed. The Royals won the world series! You probably knew this. BUT, as a result, many school districts around here cancelled school for the celebration/parade. This included our district, so we ended up with a random day off. Since no school means we don’t have to get up so early I told the kids the night before that they were welcome to watch Netflix when they woke up, and that they could also have a couple pieces of their Halloween candy and they didn’t need to wake us up. Obviously they loved this idea and it had the desired result- Brian and I got to sleep later than 6:30. Fast forward to the next morning, when, after a terrible night of sleep, Lydia got up for the day just before 5 am. I got up with her and took her downstairs where I discovered Will and Kalena, already awake and watching Netflix, surrounded by candy wrappers. Apparently I needed to specify that this wasn’t the new daily routine. 4:30! They got up at 4:30 in the morning to watch TV and eat candy. Totally killing it at this parenting thing. Yeah, yeah, Lydia actually hit 18 months in August. Whatever. Anyway, her 18 month well check was interesting- she’s jumped WAY up on the growth charts. She’s 33 1/2 inches tall (90%) weighs 27 lbs 3 oz (90-95%) and her head circumference is 19 1/2 inches (>95%.) Continuing the tradition of huge heads. Anyway, if you’ll remember (or possibly I never wrote about it here) at her 2 month appointment she was TEENSY. Like, 5% for weight and height. So yeah. BIG CHANGE. Anyway. Sleep is still…eh. Getting better I think? Maybe? Hopefully? Surely I’ve guaranteed us a sleepless night with that. We’ve been working on a couple things, sleep-wise. For one thing, she had been going to bed with a sippy of milk and sometimes if she cried in the night we’d give her a cup of milk or water. We’ve stopped both those. It hasn’t stopped night wake ups, but they were bad habits anyway. Cooking utensils, both play utensils and real ones, although the real ones are better, obviously. And last, but not least, diaper cream. Any time she’s in the vicinity of the basket where we keep diapers, wipes, and diaper cream she goes straight for it. Then she carries the tube of cream around as long as you’ll let her. You know how sometimes you make plans and then nothing goes like you expect? That was me and Halloween this year. It all started with Will wanting to be Luke Skywalker. I thought, “that’s perfect for coordinating costumes!” Daniel and Lydia are too young to care, and Kalena agreed that Princess Leia would be a good costume. I thought maybe Brian & I would dress up too, but Brian is not big on Halloween, so even with BEST THEME EVER he opted out. 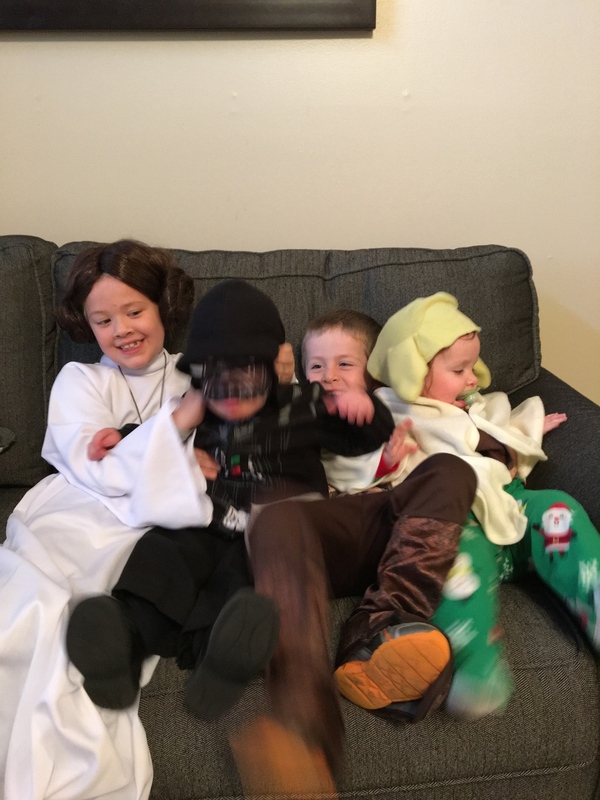 I didn’t want to dress up if he wasn’t going to, but figured it was still fine- Daniel would be Darth Vader and Lydia would be Yoda. School on Wednesday, for class parties. Here’s how that all went. On Wednesday Kalena decided she didn’t want to be Leia at school, she wanted to wear her pioneer costume (my grandma made me a whole outfit when I dressed up as Laura Ingalls Wilder once.) Which, fine (a little annoying since I wanted her to wear the costume I bought, but whatever.) I was planning to go to the boys’ parties, both of which were in the morning and not Kalena’s since hers was in the afternoon when the other kids usually nap. Instead, I ended up with a migraine Tuesday morning and didn’t go anywhere. I need to remember that lowered expectation is the key to happiness. Oh sleep. Always with the sleep. Or maybe NEVER with the sleep is a better title. Back when Lydia was a tiny, reflux-y, non-sleeping infant I comforted myself with the knowledge that it would pass. Eventually she would get bigger and she would outgrow the reflux, and she would sleep. Well. We’ve hit 2 of the 3. 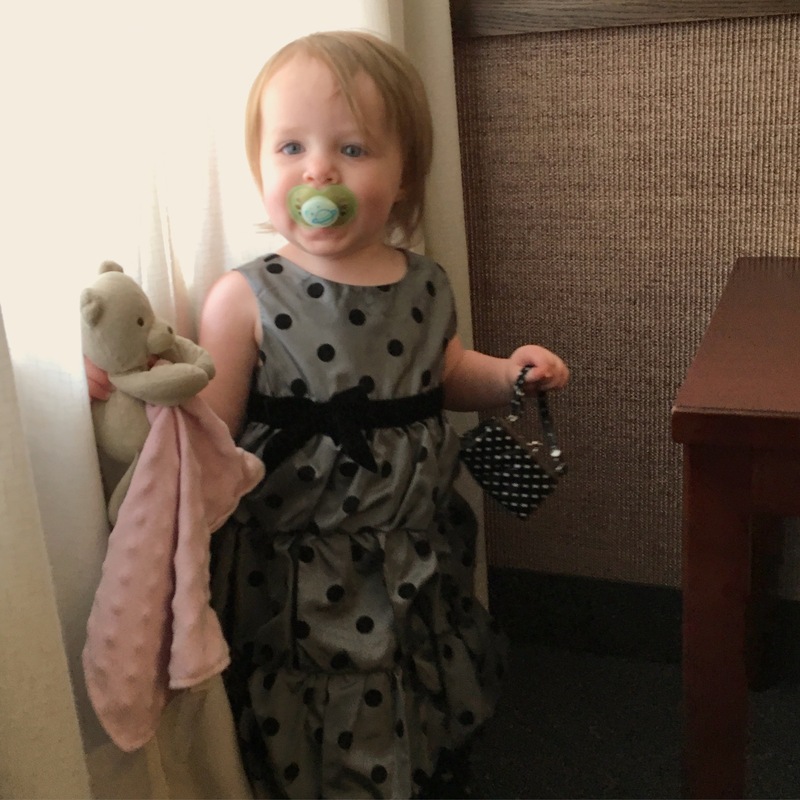 At her 18 month appointment her measurements charted in the 90-95th percentile! A far cry from her teensy 5% weight at 1 month (or whenever that was.) And she outgrew the reflux long ago. But sleep? Is still bad. Some nights she sleeps through. Sometimes even a couple nights in a row. After a couple nights I find myself hoping that finally, FINALLY we’ve hit the sweet spot and she will sleep through the night regularly. So far, that has yet to happen. She’ll have streaks of good sleep, sometimes even a week or 2 of sleeping through every night, but then it gets bad again. I suppose “bad” is relative. Some nights it’s only a quick wake up. Other nights it’s multiple wake-ups or being awake for hours. Sometimes there is a LOT of crying. It’s exhausting. I don’t know where I was going with this. Apparently I’m just here to complain? (I mean, it’s my blog I’ll do what I want.) Anyway. Maybe if she started sleeping I could manage to post here more than once every six months. Wouldn’t that be nice! Brian had Lydia sleeping through the night and I broke it. I don’t know what I did, but SOMETHING, apparently. See, at the beginning of last week (Sunday, actually) I left on vacation. It was a trip with my mom and my sisters, out to visit some of my mom’s family in California with the main purpose of picking up some boxes of things that my grandmother had left my mom. It was a great trip, but that’s not the point of this post. 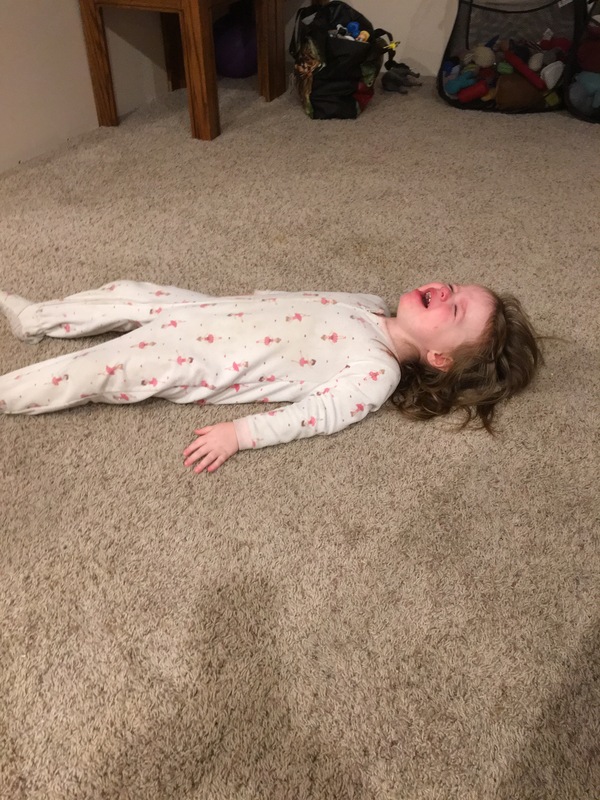 The point is, Brian was here alone with all the kids and we decided he should do some sleep training with Lydia. We figured it would be easier without me here because a) he can sleep through crying better and b) uh…I’m not sure there was a b.
We’ve never had to do serious sleep training before. We’ve done some bedtime fussing, but the other kids started sleeping through the night on their own, without any intervention from us. (Kalena at 7 months, Will at 10 months, Daniel at like 3 weeks) Lydia, on the other hand, was clearly not headed that way. She HAD slept through the night a handful of times, but always just randomly. And at 13 months old she was still waking and wanting milk usually at least twice a night. So Brian did some cry it out. 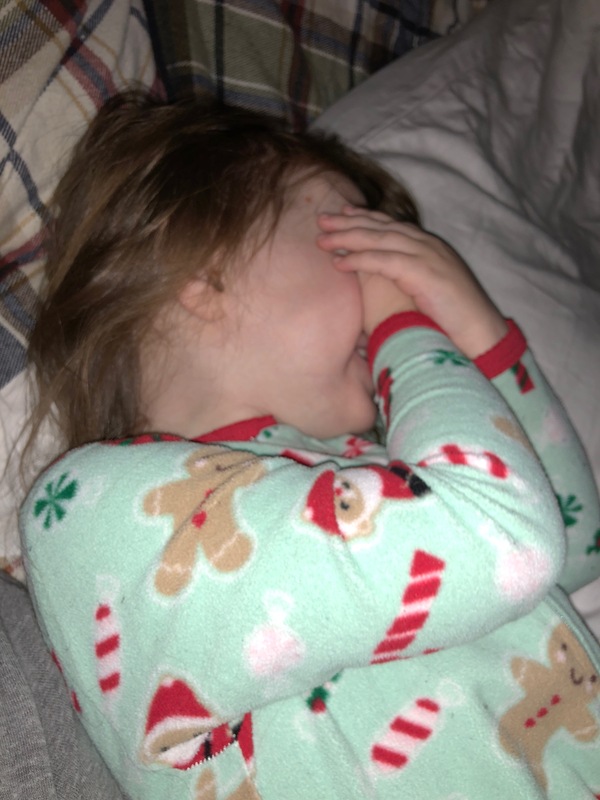 He tells me there was LOTS of crying the first couple nights, but less the third night, and only when he first put her down, so by the time I came home on Friday, she’d slept through the night three nights in a row. However, it seems my mere presence was enough to screw up all his work and in the 5 nights I’ve been home there has been quite a bit of crying. Sometimes it’s crying at bedtime, sometimes it’s during the night, never is it any fun. Also, she seems to be transitioning to one nap, except it’s not every day. (Today, for instance, she was exhausted and crying by 8 am. Definitely a 2 nap day.) I’m not sure what to do to fix it, since I’m not even sure what I did to mess it up in the first place! I’m just hoping that she’ll get the hang of sleeping through the night SOON.